Will KAZ Minerals turn, or will it continue to rise to July highs of 851p? 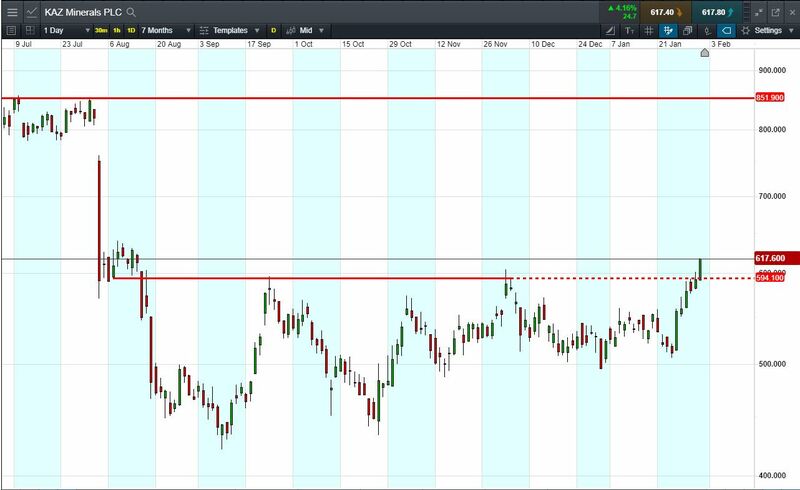 Breakout above resistance at 594p to trade 617.6p (at time of writing). The ‘trend is your friend’. Will it continue towards 851.9p? Shares -44.1% from 2018 highs; +46.2% from 2018 lows; +16% year-to-date. 24 Jan: Miner’s Q4 copper production +19%, top end of guidance. Let’s say the breakout appeals to you, you think it’s likely to continue to 851p. You decide to buy exposure to £10,000 worth of KAZ Mineralsusing a CFD, at the current price 617.6p (at time of writing). To do this, you need £2,000. Let’s assume the KAZ Minerals trend continues upwards to July highs of 851p (+37.8%). Your profit would be £3780, from your initial investment of £2,000. Conversely, let’s assume you open the above position, and place a stop-loss at 7% from the current price. KAZ Minerals breaks lower, falling 7% and it hits your stop-loss. Your loss would be £700.